PARAMUS, New Jersey (AP) -- When Mark Malkoff thought about where he could stay while his New York City apartment was being fumigated for cockroaches, he quickly ruled out friends' places (too small) and hotels (too expensive). Instead, the comedian and filmmaker decided to move into an Ikea store in suburban New Jersey, where on Monday he unloaded two suitcases into a spacious bedroom at the store. At night when the store is closed, he says he'll play laser tag with security guards and even plans to host a housewarming party. 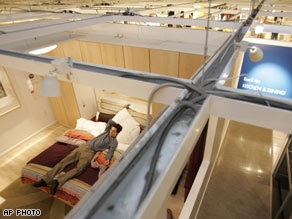 "The fact that Ikea is letting me do this is mind-boggling," said Malkoff, lounging on a bed in his new room. "There's no way I'm going back. I love this way too much." Malkoff, who works for Comedy Central's "The Colbert Report" as a ticket handler, is allowed to stay until Ikea closes at about midnight on Saturday; the store, famous for its low-cost do-it-yourself furniture, is closed on Sundays. Malkoff, 31, is known for his 2007 video "171 Starbucks" which documents his visits to all of the coffee chain's Manhattan stores in a single day. Deputy store manager Julie Mott said Malkoff contacted the store about three weeks ago and presented a proposal to move in. "We thought it would be a lot of fun and interesting," Mott said. "We're not really sure what this week holds." He is being followed by a camera crew documenting his stay for a video, which will be shown on his Web site. But despite the hospitality, Malkoff did find a few problems: The sinks don't work, and neither does the toilet, refrigerator, flat-screen television or the washer and dryer. "Is anything real in this place?" he asked. He must shower in the staff locker room and will have access to the staff cafeteria to cook his own meals, if he chooses, Mott said. 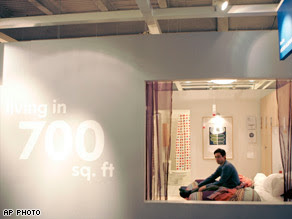 However, the Ikea display does offer more spacious living than his two-bedroom Queens apartment. "I feel like I'm on the set of 'Friends,"' he said, adding that he has met a few new faux friends -- customers who wandered into his new apartment. His wife of 2 1/2 years, Christine, isn't as thrilled with his new digs and has instead opted to stay with relatives in upstate New York. "For some reason," he said, "she doesn't want to live in a store."